If you’ve been following along with me for a while, you’ll know I am a freelance copywriter. 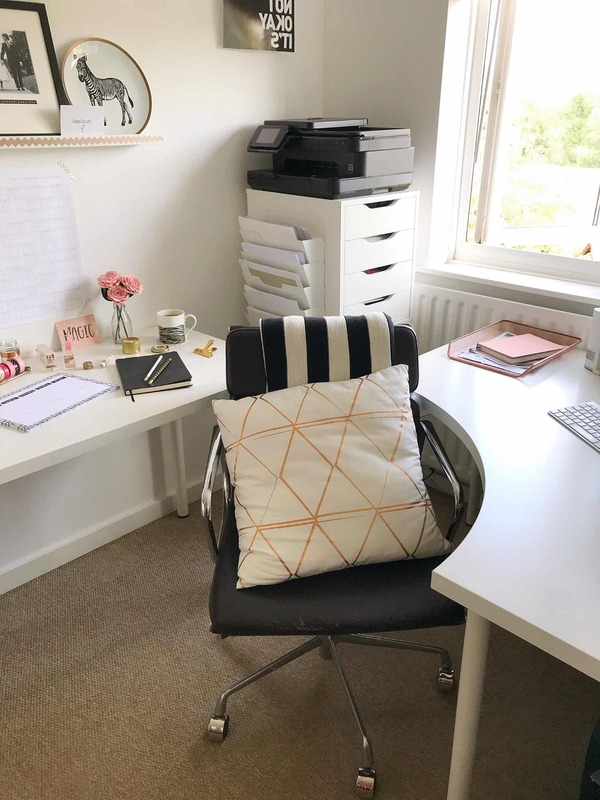 Going freelance was absolutely the best thing for me, as it has allowed me so much flexibility to work around the girls school and activities, and to write my beloved blog. Not to mention being around for the girls after school, and being able to take them to ballet, swimming and brownies. 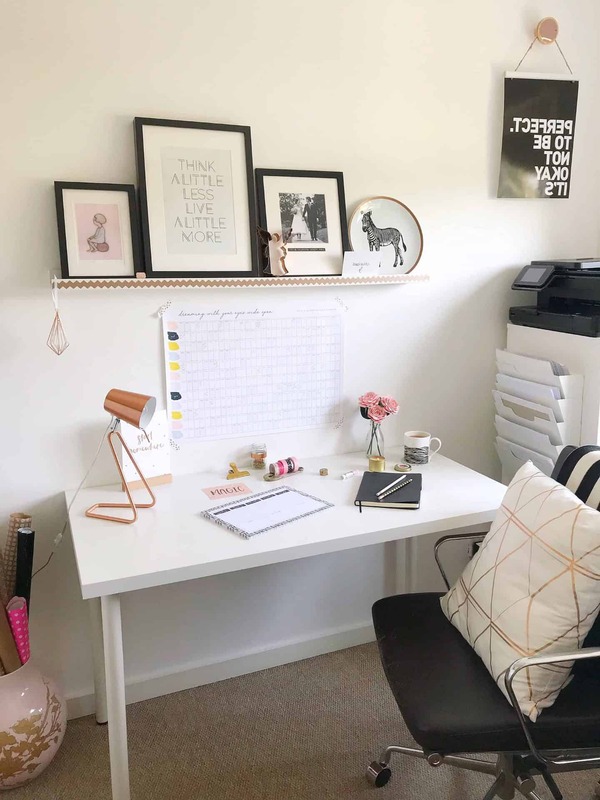 There are several things I’ve learned about being self-employed, and how to set up a home office space is one of the most important things. Recently, our home office has got ridiculously messy and cluttered, and I’ve started working at the breakfast bar in the kitchen as I can’t face the chaos. 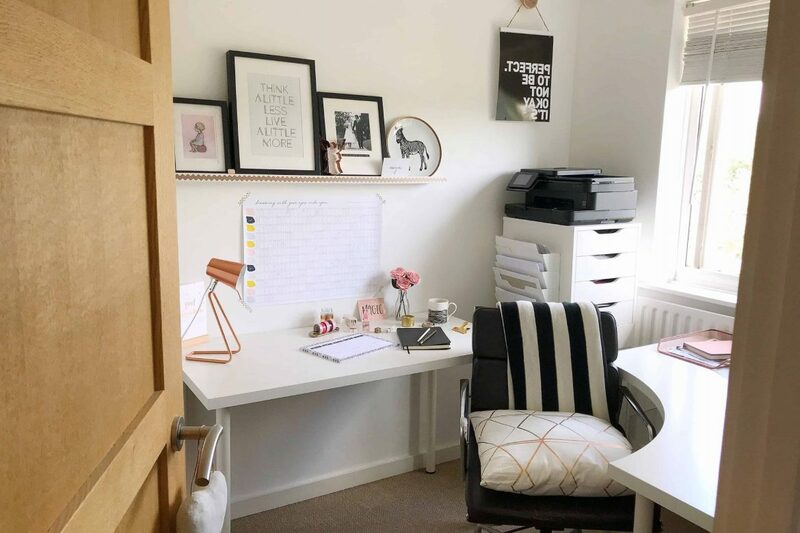 So over the summer holidays, I’ve tackled the office and restored a sense of calm and organisation. 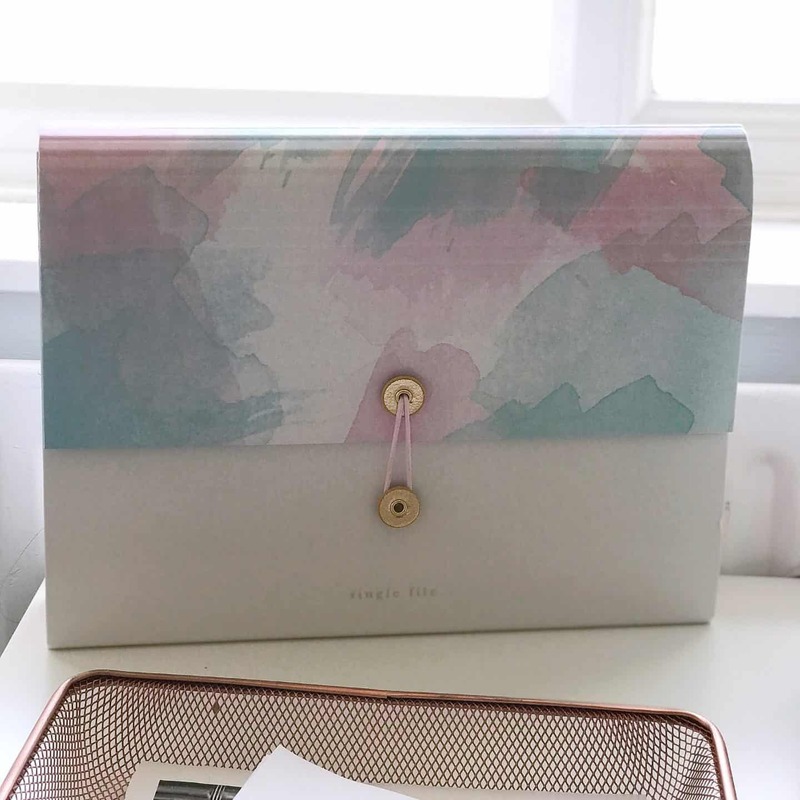 I’ve also been gifted some lovely new stationery from Got2Jot to help me get back on track and set up my home office for success again. 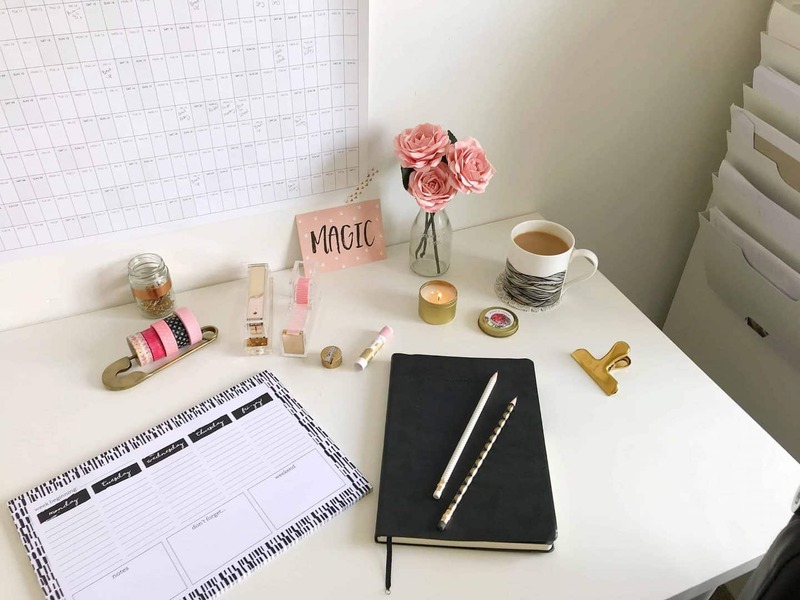 Even if you’re not self-employed, these tips would also work for you if you’re setting up a little space for your hobbies, or general life admin. 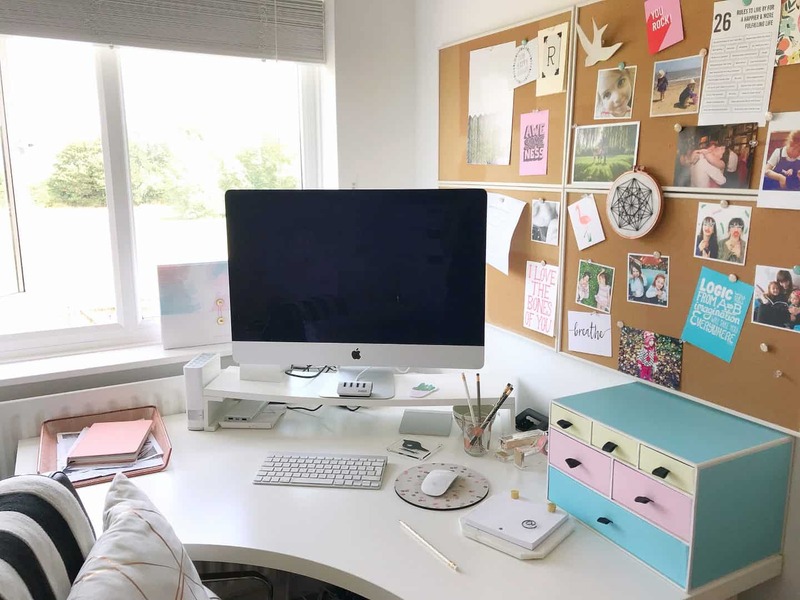 I think I’ve covered everything you need to set up your home office, but please let me know in the comments if you have any other ideas! I personally like a monochrome scheme as it lends itself so well to most looks. It’s also not too distracting! I have broken up the black and white with copper and gold accents, and a few pops of pastel shades, which I’ve used sparingly. We have managed to cram not one, but two IKEA desks into our office, one corner one which houses our Mac and a smaller one for reading, writing and (one day, if I ever get time) using my sewing machine. We just have one chair that swivels between the desks, to save space. 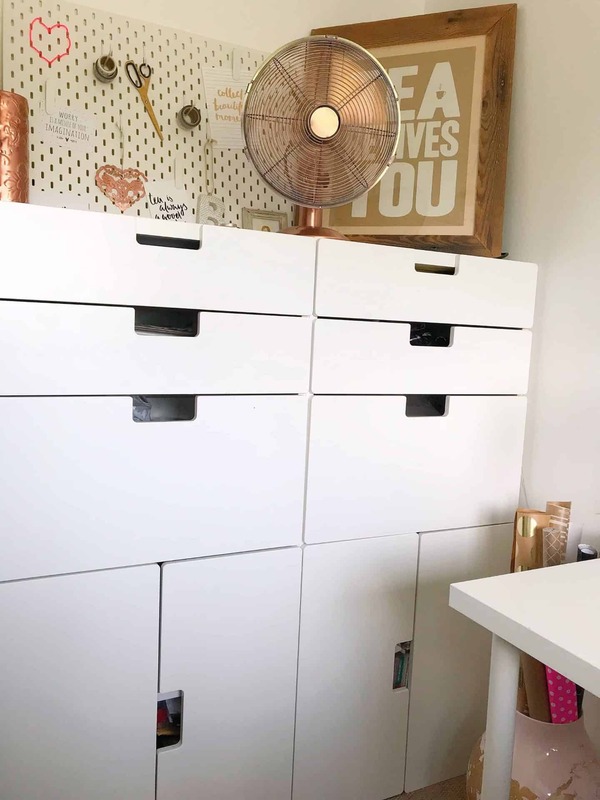 When you’re planning a home office, I firmly believe you can never have too much storage. Ours is all from IKEA, with a combination of kids’ cupboards and ALEX office storage. As it’s all white with cut out handles, it works well together. I just wish I had a way to cover up the ugly printer, it does kind of stick out! I store my wrapping paper in an oversized vase. I am a massive list-maker, so I need notebooks and desk pads to scribble down notes and to dos. 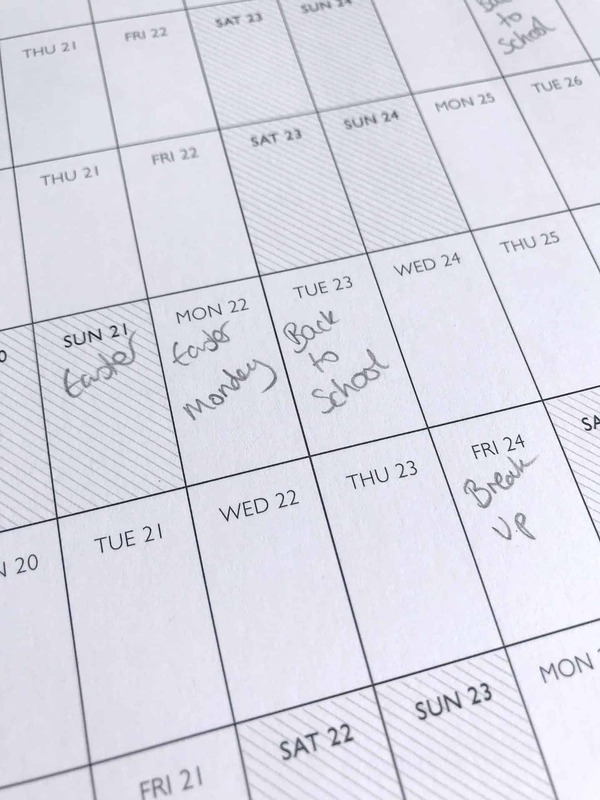 This monochrome weekly planner from Got2Jot (£7.50) is ideal for keeping me on track. I can fit all of the kids activities on there, as well as my own. The ‘don’t forget’ section is probably the one I use most. Now my girls are at school, I’ve started to think in academic years again. 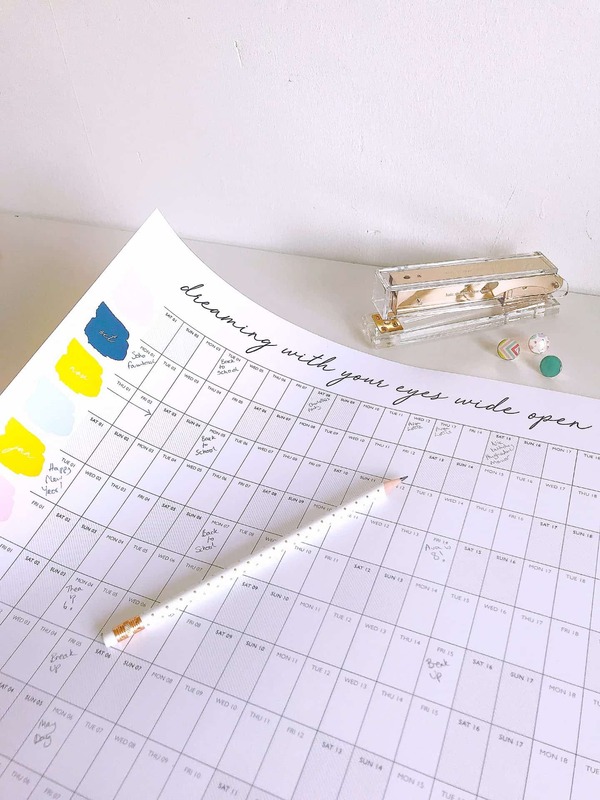 So my big academic wall planner by Doodlelove (£11.50) is so useful for seeing where you need to be at a glance. I am an eternal optimist when it comes to time, so I have been known to over-commit and then get stressed. Seeing how many weeks there are in a term will help me be realistic about what I have time to achieve, and say ‘no’ a bit more. It works much better than a week, or even month to view calendar for me. I wouldn’t get far without a notebook. 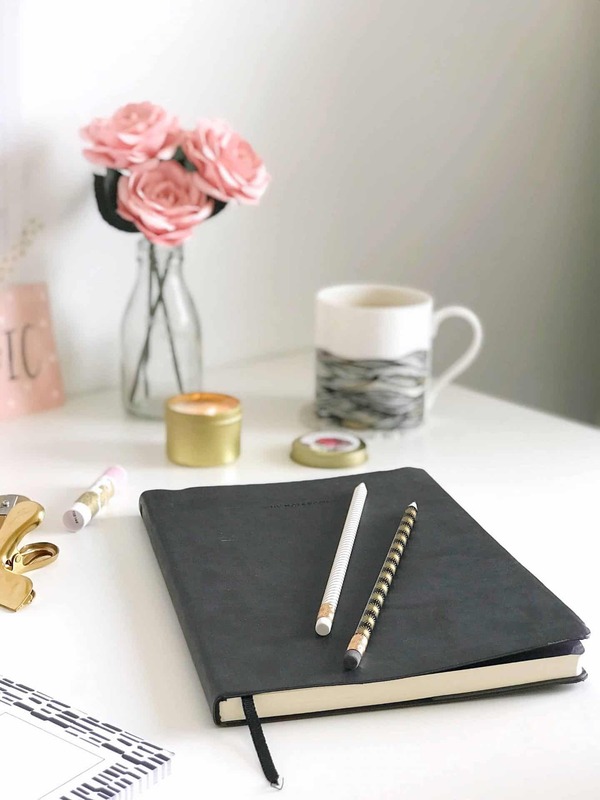 This softbound black notebook from Got2Jot (£12.99) has extra tools to keep you organised, including planners and pockets. Do you prefer pens or pencils? I love a Sharpie, but I tend to write in pencil, rather than biro. 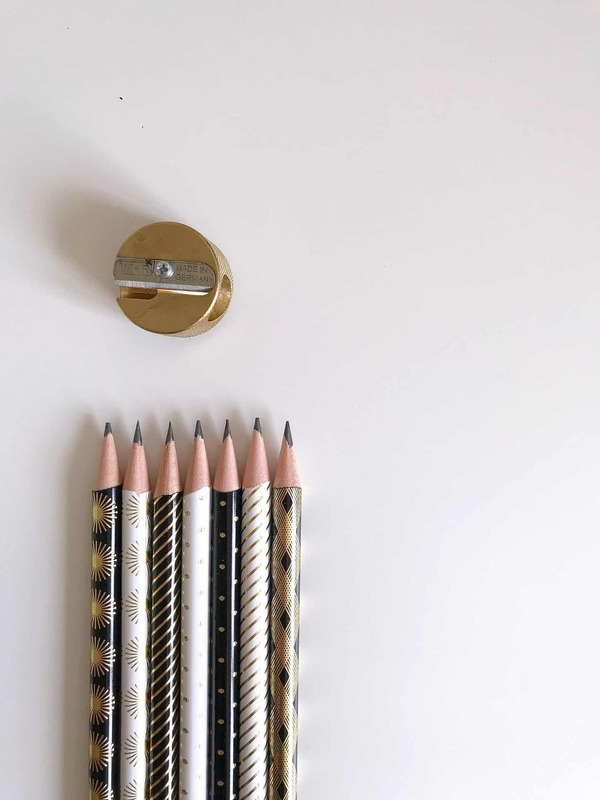 These beautiful metallic black and gold pencils (£7.99) are just the ticket for my monochrome theme. 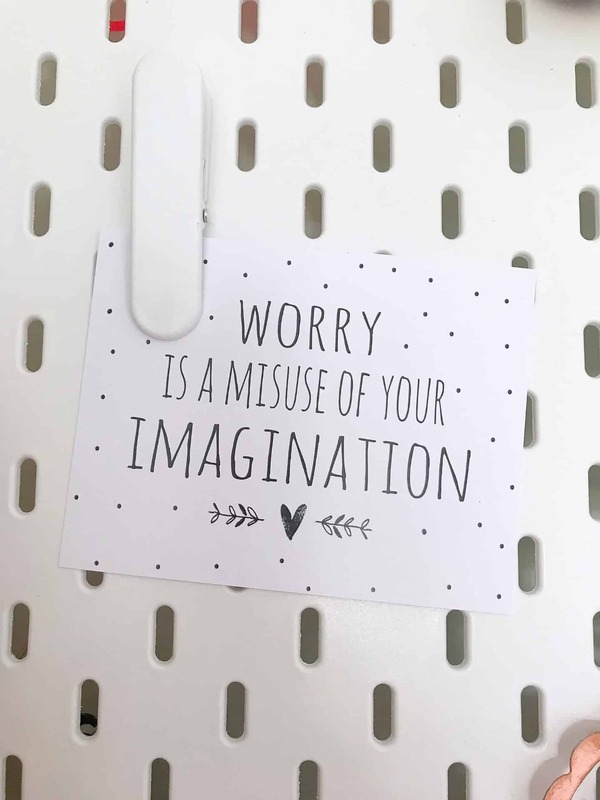 I am a big believer in seeing positive messages, so much of my wall art has little messages of encouragement and words of wisdom. 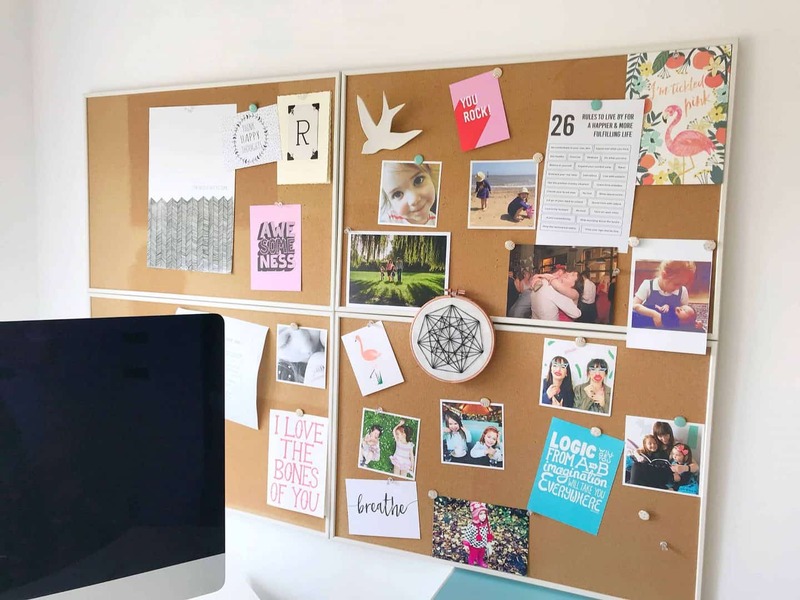 Whatever you choose for your home office, I think it needs to be personal and cheerful. I have a mix of inspirational cards from Got2Jot (£8.95 for 50 postcards) and framed pictures with a few photos. As a constant faffer, my shelf gets rearranged regularly, but this is how it looks at the moment. You can read more about my prints here, and the our wedding photo here. Our office get a lot of sun in the morning which makes it hot in summer (though oh so cosy in winter). We installed a white wooden blind, so we can filter out the sun and see the computer screen. 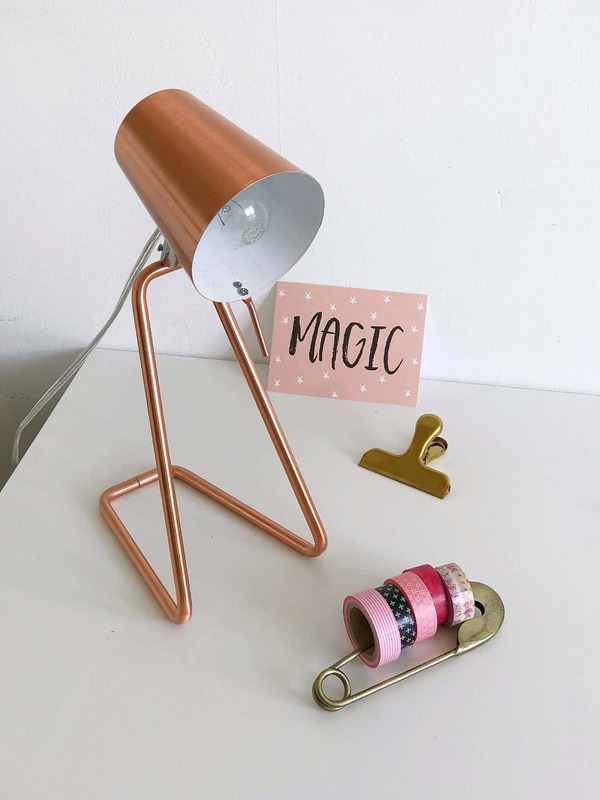 I got a gorgeous copper desk lamp to light up the second desk. I bought mine from an independent shop but they have since closed down sadly. You can buy it through my Amazon affiliate link here for £32. 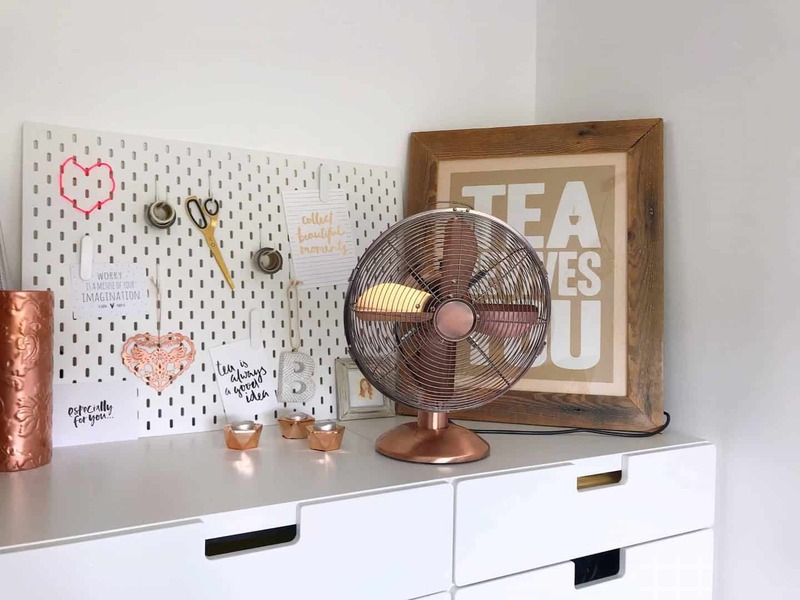 The vintage industrial style fan cools the room in summer. It’s had a lot of use in the past few months! 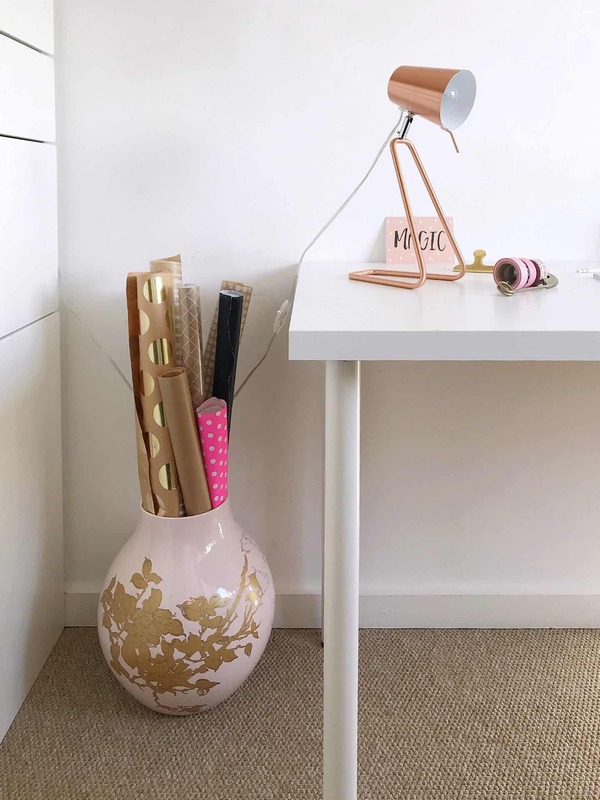 I got mine from Dunelm a few years ago, but this copper USB powered mini desk fan is just as nice, through my affiliate link for £13.49. The best thing for anyone who’s self-employed is an expandable file with 12 pockets, one for each month. I put all my invoices and receipts in this as I go along, which makes filing my tax return so much easier. Finally this is the most important thing to include when you set up your home office. Tea. I don’t know about you, but I can’t get a lot done without a nice cup of tea. 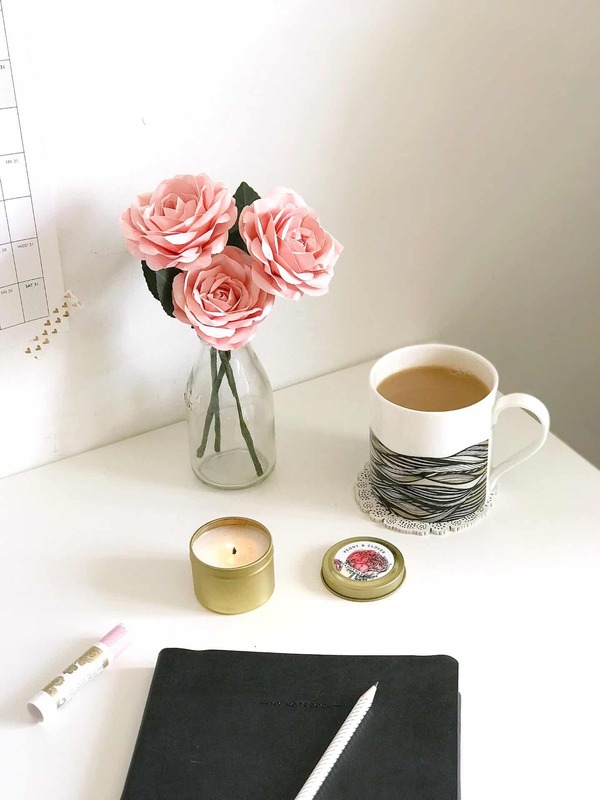 I won this mug from Nadia Alessandra, and think it goes so well in my monochrome home office. The soy wax candle smells gorgeous even before it’s lit. I think it’s important to have a lovely fragrance as well as a nice look for work. 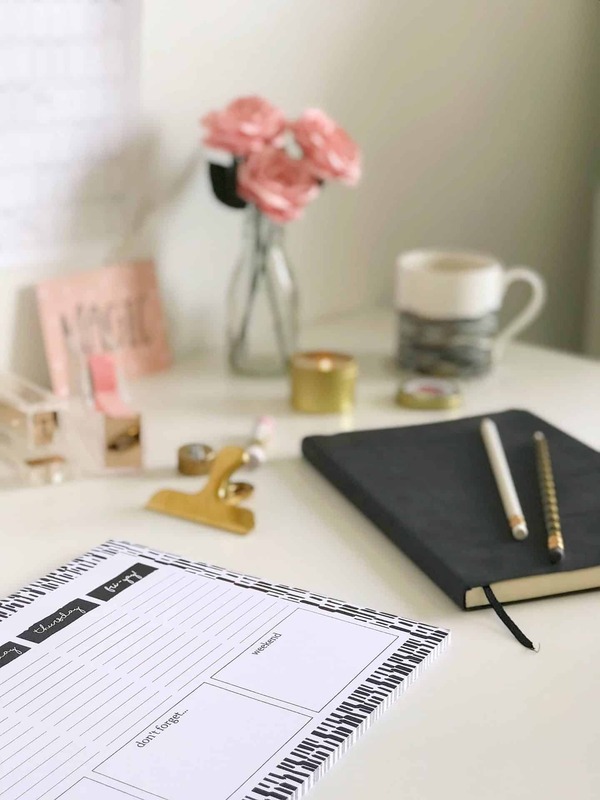 To help you get organised and set up your home office in style, check out Got2Jot, who have loads of lovely stationery and office accessories in a wide range of styles. It’s run by Sarah, and based locally to me and I’m so happy to support a local, female-owned business. 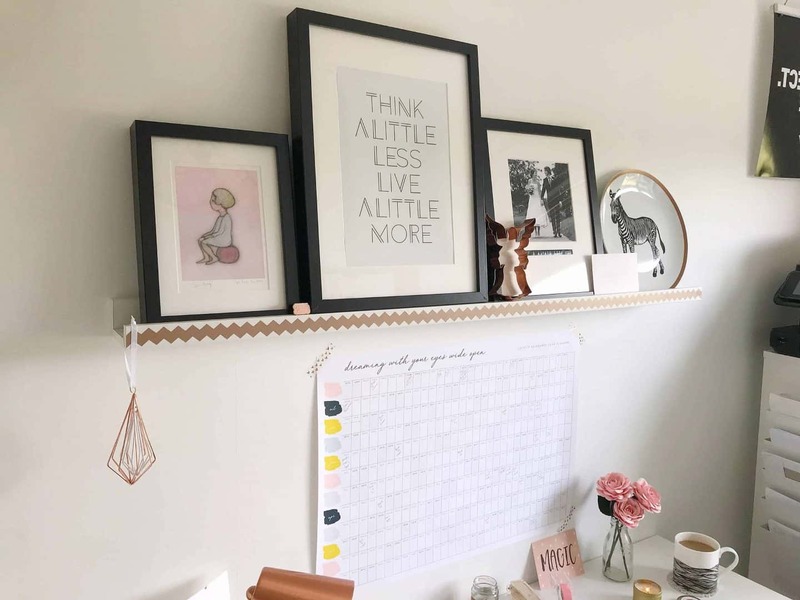 I think setting up your home office is key for productivity, but also your state of mind. Now my office is so tidy and organised, I actually want to sit down and write. 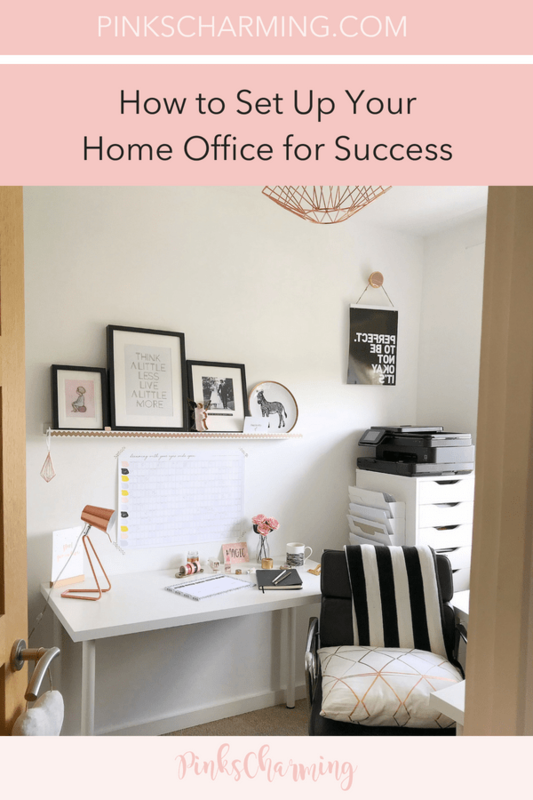 I hope you found my ideas on how set up your home office useful, why not Pin it for later? 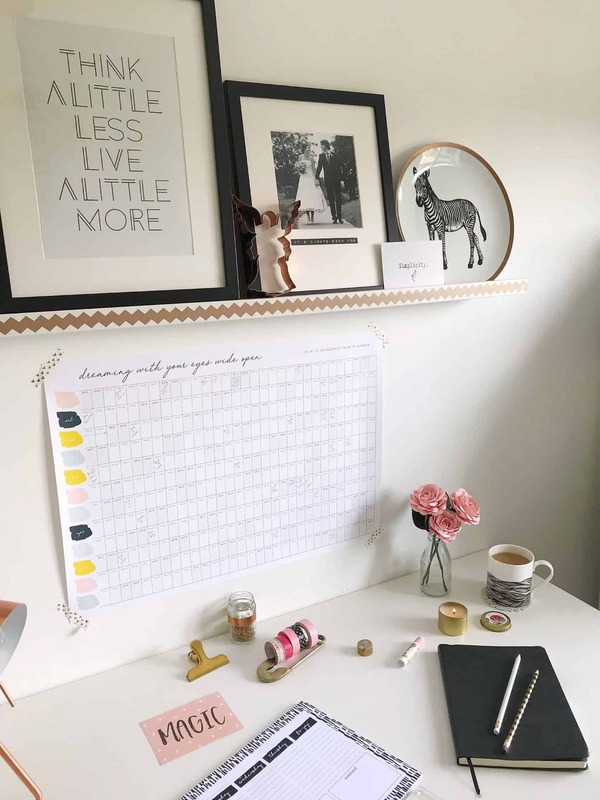 What an idyllic home office – I love your colour scheme and inspiration board! 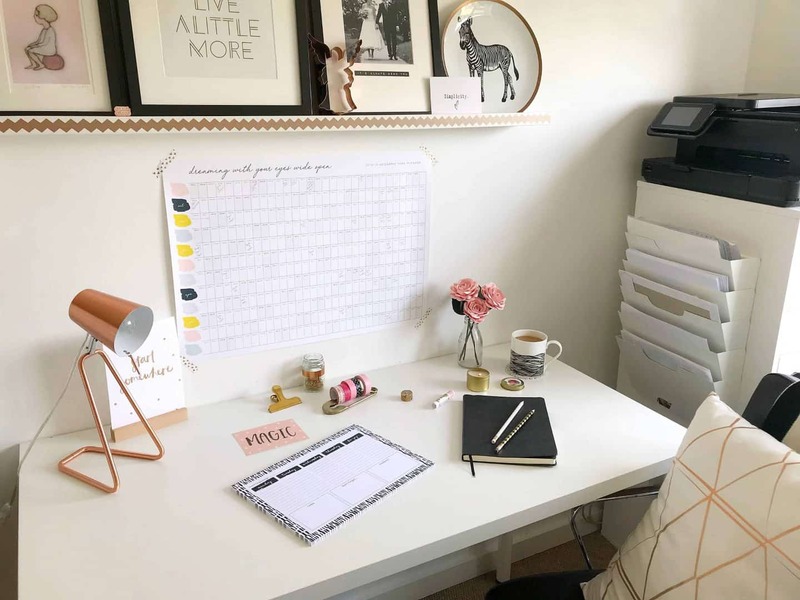 Your home office looks so lovely! I really miss having a dedicated space to work. I swear I was so much more productive when I had a home office. Now I have to work in the living room and it’s all too easy to get distracted. 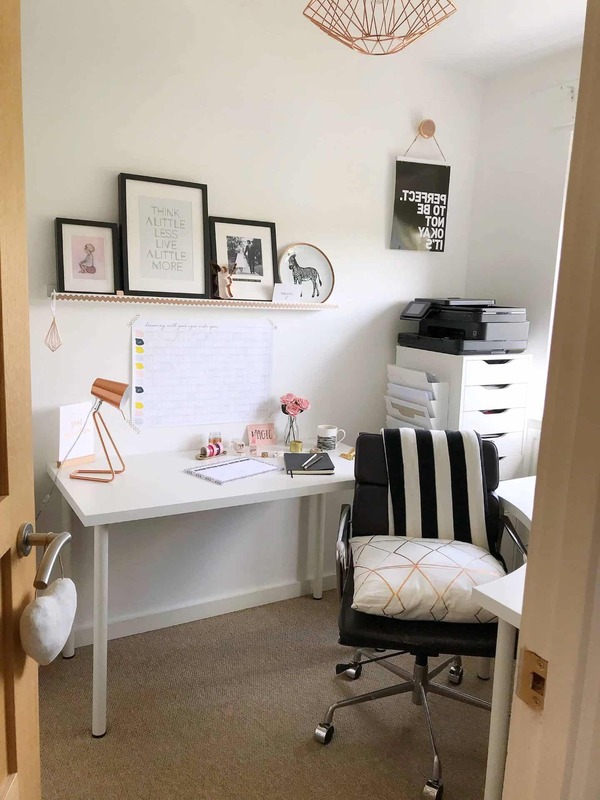 Great idea to have two desks and love the monochrome theme! Such a well organised work space. 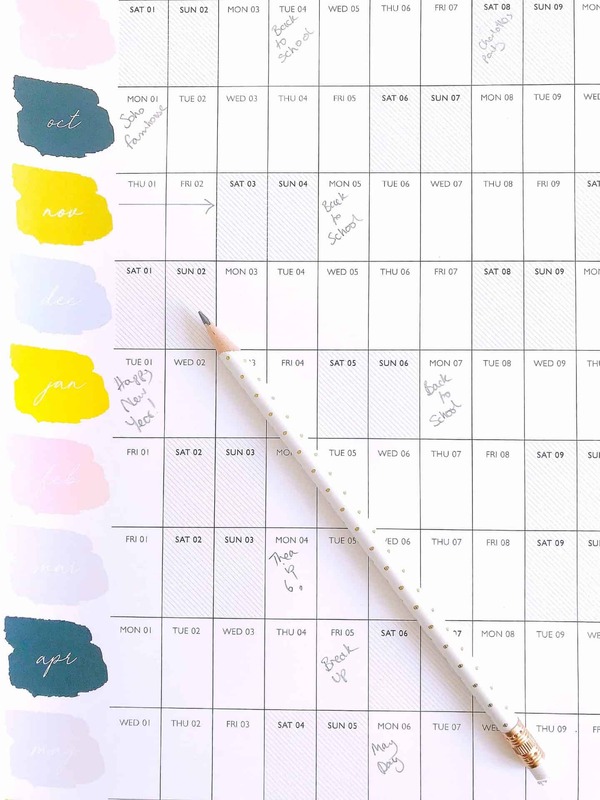 A weekly planner is a must for me. It really helps me to keep on top of everything. I didn’t know it was possible to have such a pretty office! Some great photos. A lovely workspace! I am currently in the process of making our spare room into my ‘craft room’ and your ideas have given me some food for thought-thank you!